Parmesan, tomato puree, garlic, balsamic vinegar: all kitchen staples that we use, almost unthinkingly, every day when cooking. They are also four of the ingredients in Laura Santtini‘s intriguing Taste #5 Umami Paste. Named after the delicious savoury taste common to these foods, along with the others that Santtini includes – anchovies, black olives and porcini mushrooms – umami is the fifth element of taste, the others being sour, salt, bitter and sweet. It’s the mmm-factor that you get when you have a dash of soy sauce on plain rice, taste a good chicken noodle soup or eat some of Ed Hick’s ultra-addictive bacon jam. And how does the paste itself taste? It’s intensely savoury and, as Santtini directs, I’ve used it to enhance gravy, burgers and tomato sauces. I tried it in a simple Lentil Soup, one of my winter staples, and was pleasantly surprised at the rich meatiness that it gave to the broth. But it made me think of how I automatically add umami without thinking to that soup. Remember that list of ingredients that I mentioned earlier? Parmesan, tomato puree, garlic and balsamic vinegar? Yep. Those – and some good bacon – make up a soup that’s choc-full of natural umami. If you can get your hands on it, Taste #5 Umami Paste is a great plaything with no icky ingredients, just things that you would have in your own kitchen, and no MSG. I’ve certainly had fun trying out some of the suggestions on Santtini’s website and it’s the perfect go-to when you don’t have time to build up layers of flavour. Try it – and see if you’ve unknowingly been adding umami all along in your cooking. 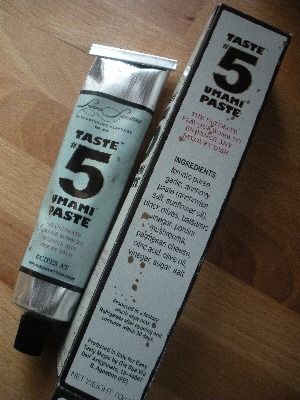 Taste #5 Umami Paste is available in Superquinn and Supervalu branches throughout Ireland. I was sent this product to try by Panache PR. This is a great basic soup recipe that you can fiddle with in any number of ways. Vegetarians for lunch? Leave out the bacon and use vegetable stock made with Marigold stock powder. No bacon? Use some chorizo. Got a parmesan rind in the fridge? Add it with the stock to increase the umami content. When prep-ing your veg, think about whether you want a chunky vegetable soup or something a little more refined and chop accordingly. Double up for an epic come-and-come-again pot. Heat the oil in a heavy-based soup pot and fry the bacon on a medium heat until the fat starts to run. Add the chopped onion, carrots, celery and garlic and cook gently until the onion softens, about 6-8 minutes. Stir in the lentils, tinned tomatoes, tomato puree, stock, bay leaves and thyme. Bring to the boil and then simmer on a low heat, covered, until the lentils are cooked, approximately 30-40 minutes. Stir in the balsamic vinegar and season to taste. Serve with plenty of crusty fresh bread or, our especial favorite, wholemeal toast, spread with Cashel Blue cheese. You poor thing. Those are three ingredients that I love using. 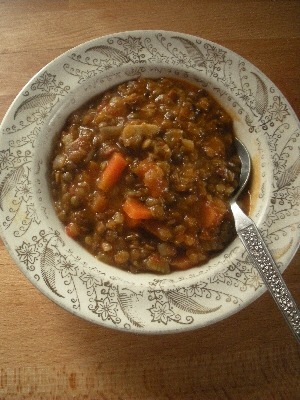 Lentil soups, lentil salads, chickpeas for stews and salads – and chilli sprinkled throughout. I’ve had a few slip-ups with chilli in food meant for Little Missy – she now knows about drinking milk to counteract the heat! – but now we keep a shaker of chilli flakes on the table so each person can add according to their own requirements. Might be helpful for you?